So I won in the Microsoft Surface in the Classroom Design Challenge. I first found out about this contest while researching the Surface Pro 2, this was for a potential purchase to take with me on a trip to Europe. While looking into the Surface I subscribed to the Surface team’s YouTube channel. Upon making my budget I decided that while the Surface is a great device, it was outside my budget for the trip. In December of 2013 the Surface team’s designer, Ralf Groene, created a video advertising an idea challenge called the “Microsoft Surface in the Classroom Design Challenge”. The idea of the contest was to come up with an idea of how I would envision the classroom of the future. I decided to enter the contest for a few reasons, the first is that I truly believe that technology can solve many problems in today’s classroom and education in general. The second reason is because I already had a few ideas on how to approach a new technology for the classroom, I have looked into the problems and have come up with a few ideas before. The third reason is because I wanted a Surface device and I thought “why not”. To enter the contest a contestant needed to do three things, create a title (25 words max), create a description (100 words max) and a picture. My entry was titled “Turn Textbooks into Social Discussions”, the description went over how students should be able to create discussions threads within a textbook document that other students in the class can talk about, and the students should also be able to post these threads anonymously. The picture I had accompanied with this description was a excerpt from Shakespeare with a discussion thread beside it talking about what Shakespeare meant with some of his words. I then submitted the idea and hoped for the best. This contest was set-up in three parts, idea submissions, a voting period and final judging. After I submitted my idea it was then put up against all the other wonderful ideas others had. During the voting period users could login and vote for the idea they thought was the best, a couple times my idea was on the front page, I was very excited, I watched the page constantly. At the end of January the voting period ended and we needed to wait until Microsoft announced the finalists. At the end of January I found out that I finalized in the contest. Finalizing in this particular contest meant more than just being judged, it meant that I already won a Surface Pro 2 device for myself, I was over the moon and I was very happy. In this contest there were ten finalists, I read through all of them carefully and a lot of them were extremely good. The judges had a week to judge the finalists and after they had selected their favorite idea I still needed to wait another week, this is when I received an email stating I had won the contest. This means I get to pick a school to receive thirty-two Surface 2 tablets, thirty-two touch keyboards and one Anthro charging kit. To say I was excited was a vast understatement I couldn’t believe it, literally after mailing ePrize the confirmation that I won the contest I was still in disbelief. It took me well over a week before I told anyone outside my family and friends. This is when I contacted my high school, Anderson Collegiate Vocational Institute, I wanted to give something back to the place that allowed me to learn about technology and decide to make a career out of it. After contacted and met with the faculty, I left with the promise that they will be receiving the devices and the recipient school for the contest. Again I am glad I had the opportunity to give this to the school. At the end of March I received notification that the tablets would be arriving in the first week of April to the school, I couldn’t wait for them to arrive. 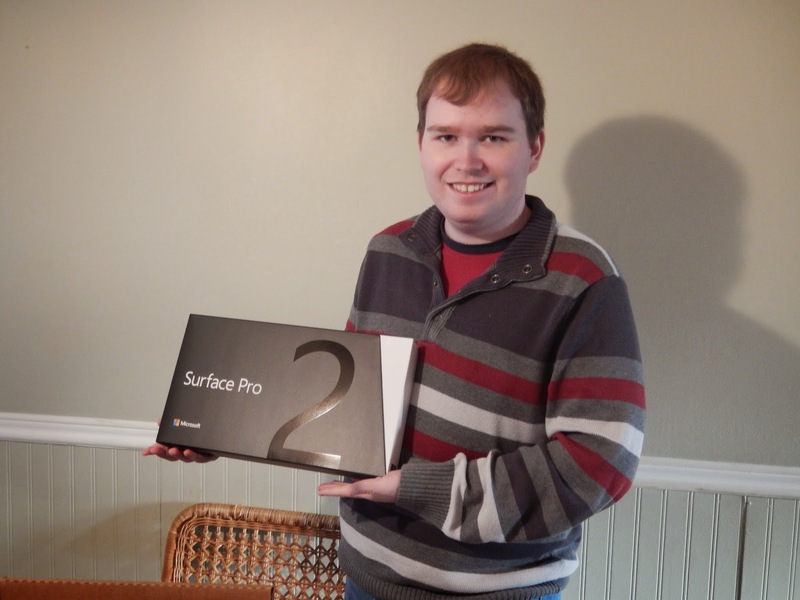 However when I got home that day my Surface Pro 2 had arrived at my home, I was very excited I love technology and this one a new device to try out and my computer to take to Europe. I really like the Surface Pro 2, it has the power of a full laptop with the form factor of a tablet. I started using it immediately at school and even programmed some school projects on it. The device is able to run Visual Studio and eclipse so it fit my needs for most projects. I’ve had a blast using it! When the tablets arrived at the school I was excited, I have visited the school twice. The first time I met with the students that will be using them and saw some of the current projects they are working on, very cool stuff. The class I gave it to has under gone some changes since I took it, they have new equipment and much more software to work with, I am glad they will have these devices to further improve the classroom. The second time I went I was able to see the tablets and the case they are in, it is very cool to see everything in action, I hope the class can put them to good use. Overall I am glad I was given this opportunity to give these devices to my high school and I really like the device I have received. I am honoured that I was chosen as the winner of the contest and it has been a wonderful experience. The RBC Next Great Innovator Challenge!